Robert Woodward made his name exposing the corruption within the Nixon Administration. Since then, he has had an almost unparalleled access to the White House and the cabinet through eight successive administrations. His books have generally been spot-on accounts of what happens inside the White House under a given president. And his account of Trump’s White House paints a disturbing portrait of a Federal government that is rudderless at its highest level. 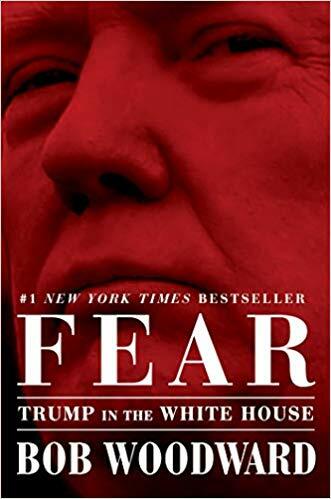 So Fear begins with a level of credibility Fire & Fury did not have. ﻿ There are similarities to Michael Wolff’s Fire & Fury. However, Woodward is a more meticulous writer who checks and rechecks his facts whereas Wolff gets sloppy with names and dates. I was willing to believe some of Wolff’s assertions, I’m more confident in Woodward’s. Part of this is a lack of Wolff’s conversations between people when it’s not really clear he even talked to the participants. Everything is attributed to at least one of the people in the room. Conversations are presented as recollections by those present. The downside to this vs. Woodward’s previous books is the lack of participation by its subject, one Donald J. Trump. Trump refused to talk with Woodward but is willing to call the book fake. This is unfortunate, because, despite denials, many of the principles have described a presidency that is spinning out of control with no way to save it. There is a quiet coup going on in the White House by some too scared to exercise Constitutional means to resolve what they see as a crisis. That, in itself, is a crisis.